Fifteen?! Seriously, kid … you have got to stop doing this. Enough is enough. It seems like every time I turn around, you are back at it again, blowing out candles and getting people to bring you gifts. If you would just look at this from my perspective, I think you would see how all these birthdays are not only making you grow up quicker than I’d like, but it’s aging me as well. Really, it will be okay if you would just lay off the birthdays for a year or two. Okay, okay … I’m just kidding around. I really don’t want you to stop growing up. I just wish you wouldn’t grow up so quickly. But now that I’ve gotten your attention, I’d like to take this opportunity to tell you how proud I am of you, and what a joy it has been to be your mom for the past fifteen years. You know, there was a long time when I wasn’t sure I’d get to be anyone’s mother. I want nothing more than a baby of my own, but for close to three years it seemed like that chance may never come for me. And then, rather unexpectedly, God gave me you. 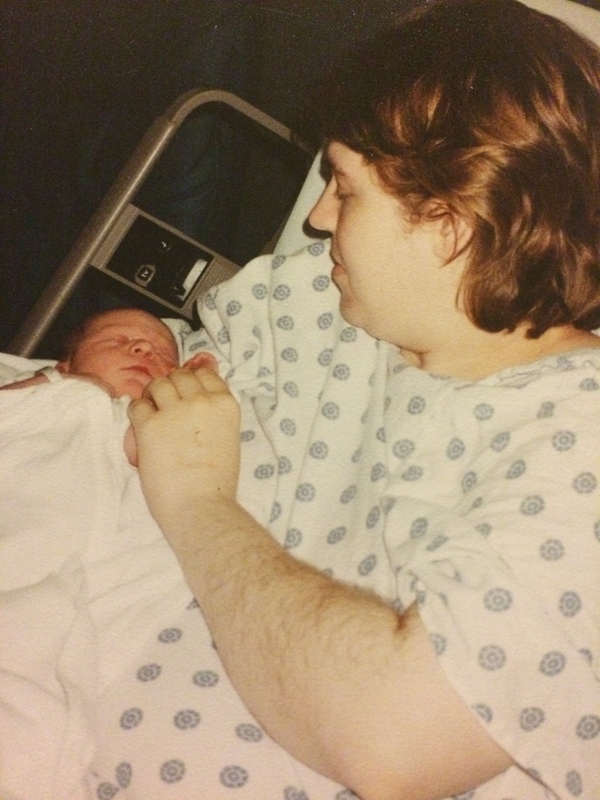 Before I became a mother, people told me all sorts of things about parenthood. Much of it was true, but none of it prepared me for loving you. From the very beginning, my experiences with motherhood have showed me one thing: Expect the unexpected. Things rarely work out the way I anticipate. But, I’m glad to say that most of the surprises have been good things. Right from the start, my plans for being a mother went on a completely different path than I ever had worked out in my head. You see, I figured I would have a houseful of girls, all pink and perfectly frilly. But when I found out that you were a boy … well, I was overjoyed. 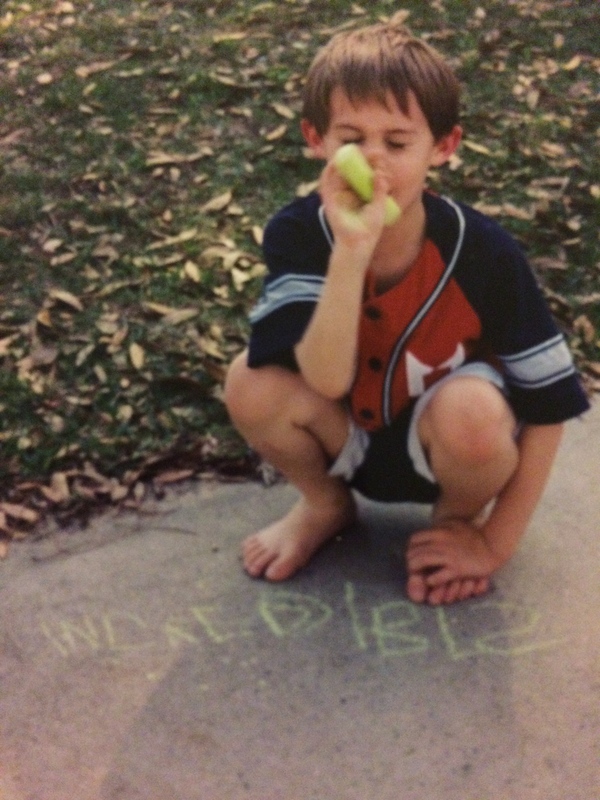 Before I knew it, my home was filled with boy toys, boy activities and boy noises. 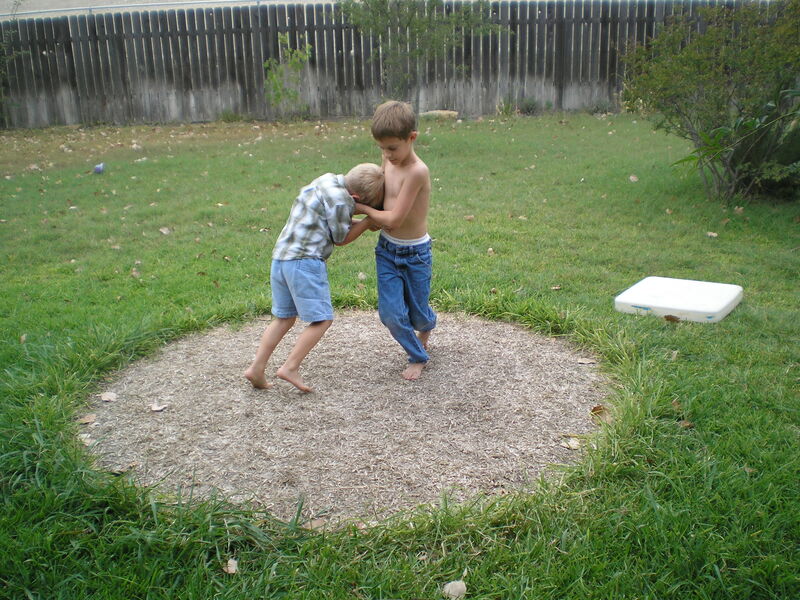 Wrestling with your brother, throwing balls in the house, burping contests … these are things I never had to teach you. While I must admit that I really don’t understand what it means to be a male and sometimes boy behavior annoys me, I’m so very glad God saw fit to give me the son I didn’t even realize I wanted. Of course, the unexpected joys didn’t stop after I found out I was expecting a baby boy. You see, I thought I knew what it would be like to care for a baby, but you turned everything I thought I knew upside down, and mostly in a delightful sort of way. For example, one of my earliest unexpected delights was bringing you home from the hospital as a newborn and discovering that you were practically sleeping through the night. I could feed you at 11 pm and you slept peacefully until around 4 am. I marveled at how most parents of newborns complained of being up several times a night with babies who constantly want to eat or who seemed to have their days and nights mixed up, while my baby slept like a champ from the very beginning. There was no doubt in my mind that I had one special kid to call my own. 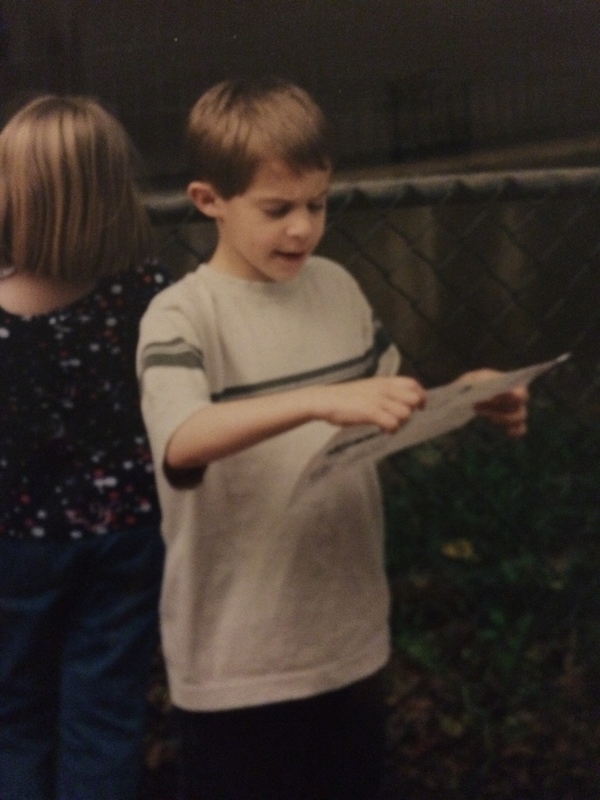 Age 4 … reading a map at the zoo. Several years later, I found myself driving you and your siblings halfway across the nation to see your father. In that era of life without a smart photo or GPS to direct me, I found myself unable to drive and read the map at the same time. Afraid of getting us hopelessly lost, I prayed, asking God to help me stay on the right roads. I hadn’t gone another 10 or so miles when I realized that you were sitting in the backseat, following our path on the map in your lap. You were only seven and yet somehow you navigated me from north Louisiana to remote cabin in the Blue Ridge Mountains of North Carolina, once again amazing me by doing the unexpected. Sometimes I say I don’t like surprises, but because of you, I’ve learned to treasure those unforeseen moments. 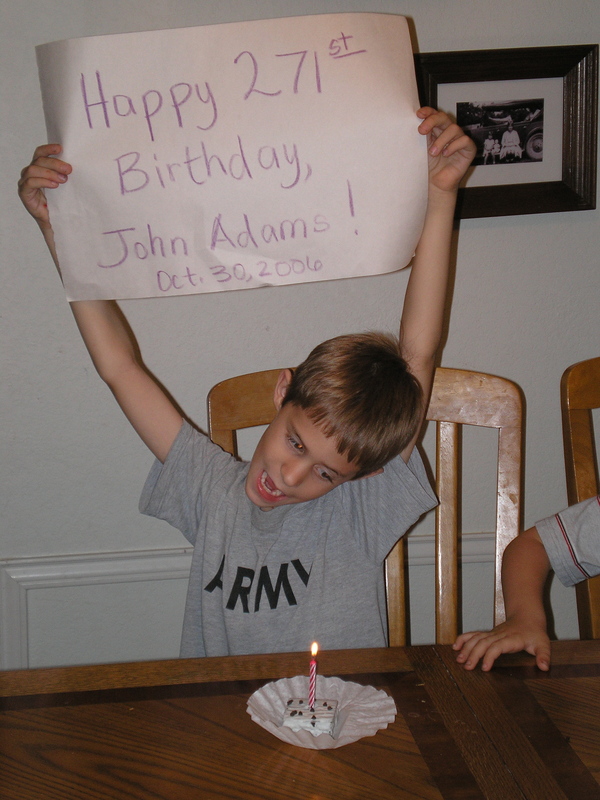 At your request, we celebrated President John Adam’s 271st birthday … complete with cake and candles. Only for you, Joel. Only for you. One of the best things about being your mom is that you have a way of making me laugh. Perhaps it is because you do so many unexpected things. Perhaps it is because you are just a funny sort of guy. Whatever the reason, being your mom is a hoot! Your quirky sense of humor; your crazy antics. I enjoy the playful banter we often share with each other. You’ve kept me laughing for the past fifteen years. And you know what the Bible teaches us about laughter … it’s like good medicine for the soul (Proverbs 17:22). But sometimes life isn’t all fun and games. You’ve taught me a lot about how to get through tough situations instead of being stuck in a place of anxiety or worry. Because of you, I’ve discovered that bravery comes in all sorts of forms. You must have been about six years old when I realizes what a brave boy you really were. 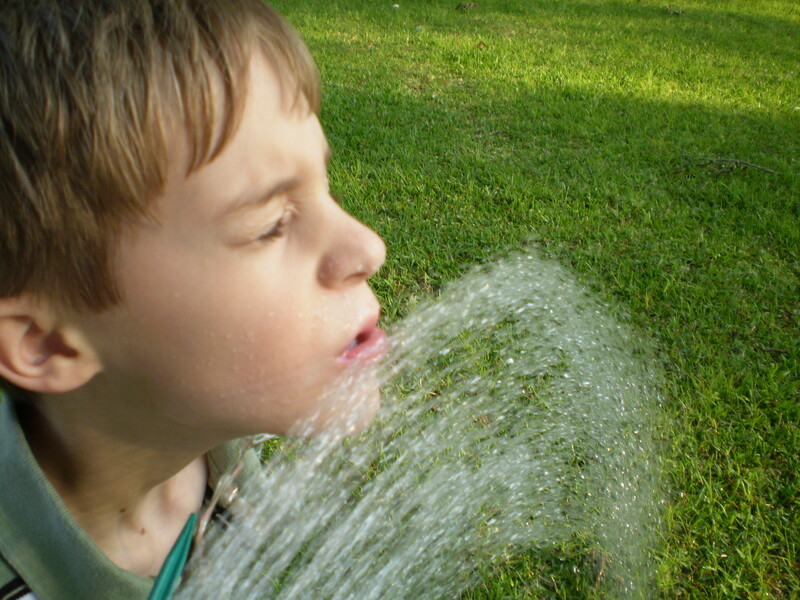 At that time, you were terrified of water being on your face, especially water anywhere near your eyes. I never quite understood that fear, but I could tell it was rather deep-seated. One afternoon, all of the cousins were playing together outside. I noticed you watching all of the kids drinking water from the hose … and I could tell you were torn between not wanting to be left out and the fear of doing getting your face water. It was pure agony watching you wrestling with yourself that way. Then again, I shouldn’t have been surprised. You’ve always been an overcomer. Do you remember the time we spent the weekend with another family for a big homeschooling get-together? There were lots of kids, big and small and in-between sizes. 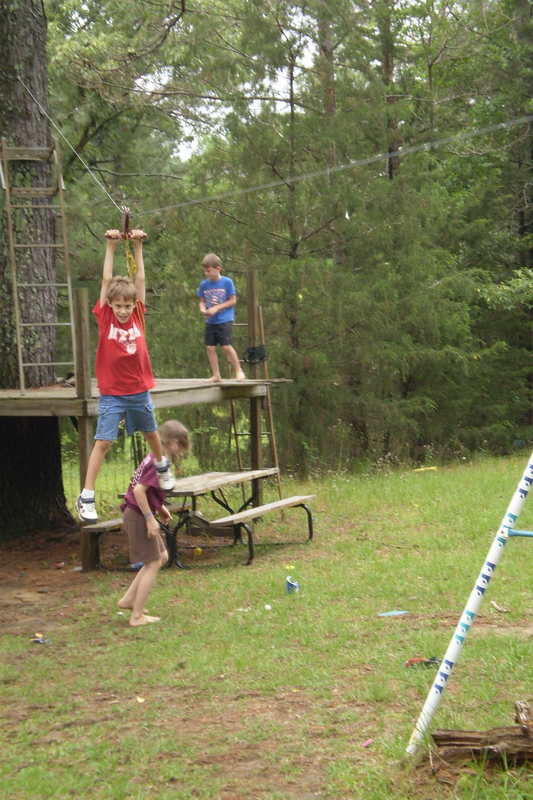 Some of the bigger kids were taking turns riding a zip line. Oh, how you wanted to go down that zip line! It was one of those times when I couldn’t do anything to help you … all I could do was watch and wonder if you would gather up the nerve to give it a try. And just when I thought you had given up on the idea of attempting that daring feat, I heard the sound of kids clapping and cheering. I turned around just in time to see you finish your first ride on the zip line. As your feet touched the ground, a smile broke out on your face that was a bright as a thousand beaming lights. Joel, there is nothing shameful about experiencing feelings of fear, for it is just part of being a human. However, it is what we do with that fear that builds our character. Watching you that afternoon, I learned a lesson about facing our fears head on. I was reminded of how often the words “Don’t fear” or “Do not be afraid” appear in the Bible. I pray you never forget God is with you even in your biggest fears. 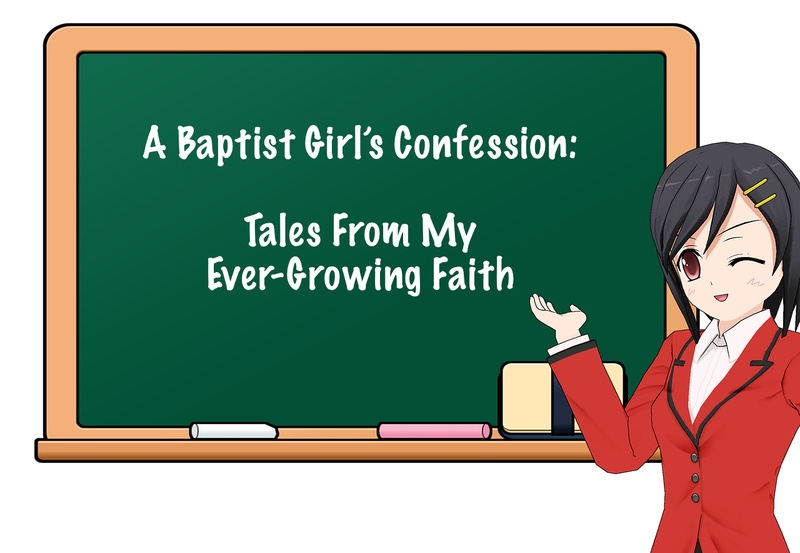 As a parent, it’s been one of my biggest joys and responsibilities to teach you about the character of God. Just as He doesn’t want us to fear, God also loves a cheerful giver. The pile of gifts you bought for children in Iraq. Over the last fifteen years I have been inspired by your selfless generosity. 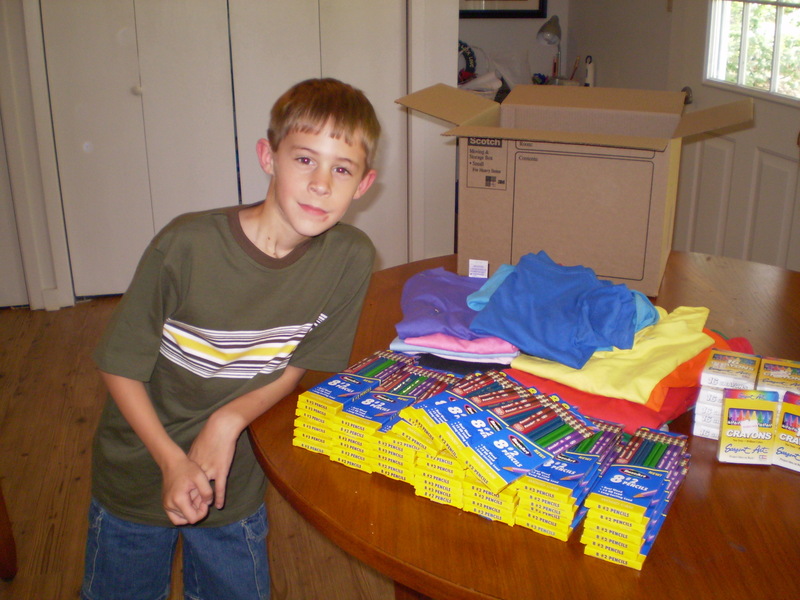 I’ve always been especially proud of your requests for your 7th birthday when you asked your friends to give you money to buy schools supplies and clothes for the soldier’s in your father’s Army unit to give to the children in the Iraqi villages near where they were stationed. That you would do such a big thing at a young age is still so very amazing to me. 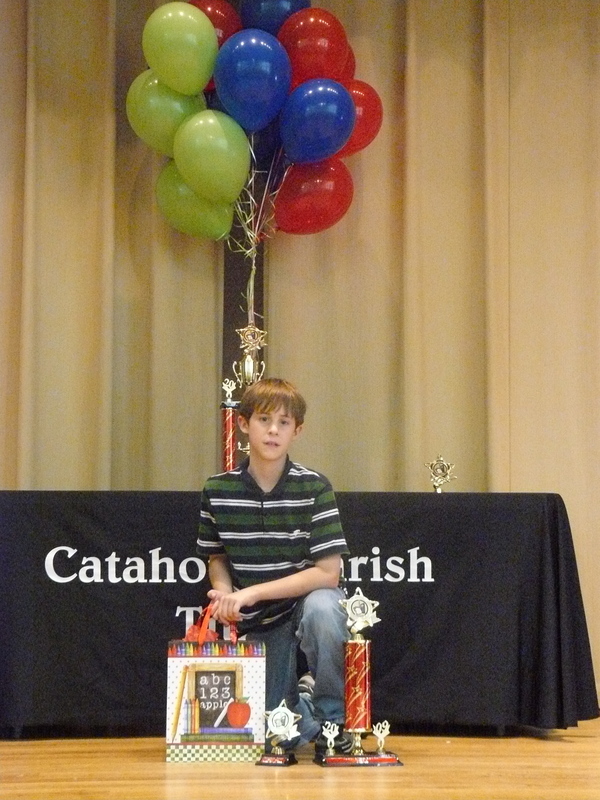 Parish-Wide Math Bee Champion … Again! Joel, you are an intelligent and bright young man. I knew it when you were a tiny boy, but every so often I am reminded of it again … such as when you taught yourself to read before your fourth birthday or when you won the parish-wide math bee two years in a row. 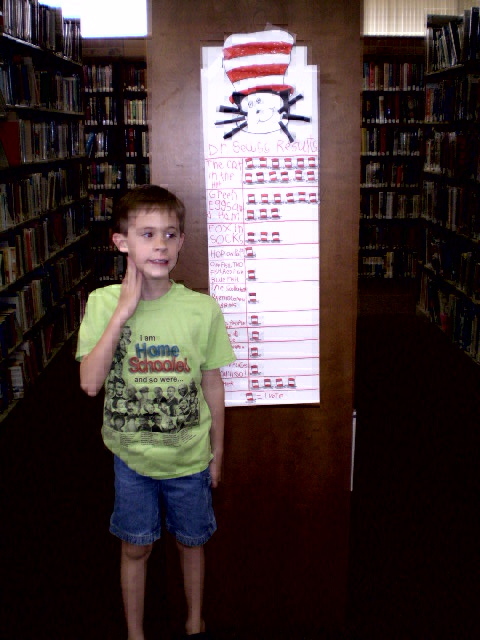 When you were in the first grade, you wanted to know which Dr. Seuss book was most-loved. You decided to take a poll and asked the local library if you could conduct a survey. To my delight, you got lots of participants and created a fun graph to display with the results. It wasn’t just the activity that impressed me, but also the sheer joy you obviously had while doing it. I love that you are an eager and passionate learner. This has been a character trait of yours since you were a very young boy. 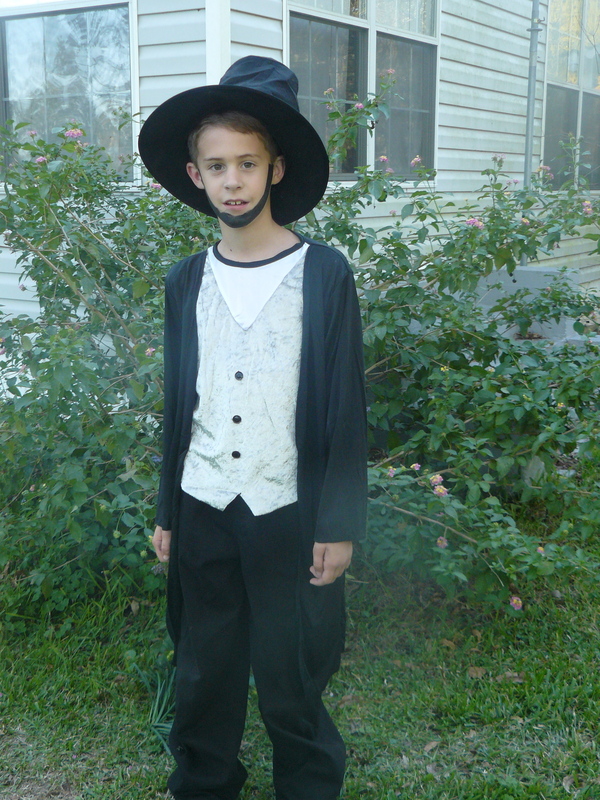 I’ll never forget the day you first learned about Abraham Lincoln. Not quite four, you were fascinated by the tall man with the tall hat who lived long ago. Within just a few weeks, you were taken with everything presidents, a passion that lasted for the next several years and included you writing personal letters to every living President and First Lady. Among the items I’ve saved for you are handwritten letters that you received from Jimmy Carter, Gerald Ford, and Lady Bird Johnson. Later on, your fascination turned into an interest in politics. Seeing you participate in activities like Teen Pact, Camp Joshua, and serve on the state 4-H Citizenship Board are just further reminders that this is a God-given passion and He gave it to you for a purpose. And you have other gifts too, like your talent for public speaking. It comes so naturally to you. I’m always so proud to see you serve as that Master of Ceremonies for our homeschool praise night, or go compete in another 4-H speaking contest. You just do it so very well that it gives me a certain parental joy to see you succeeding. Joel, when I see you working with numbers and talking statistics, reading about and discussing today’s big political issues, or speaking to a group of people, I feel God’s pleasure reflected in you. I hope you do too, for each of these are God-given gifts. Sometimes I wonder if you ever will run for a political office or if you will be be a DJ on a news radio station or perhaps be a statistician for a politician … maybe you will do something else, completely unexpected. But, whatever it is that you decide to do with your life, I know you will stay true to the honest principals by which you have been taught to live. 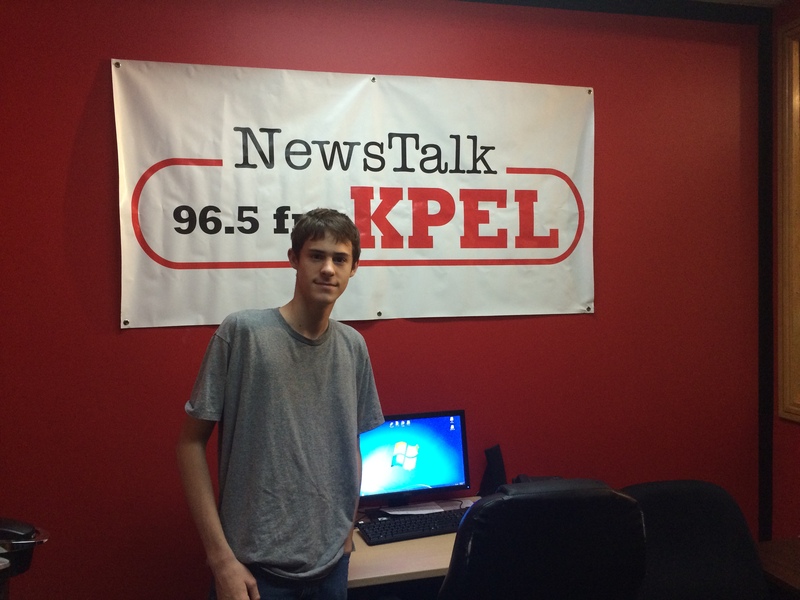 Joel, you are an incredible young man, the God-given answer to one of my deepest prayers. I know He has a purpose for your life, good things He has called you to do throughout your years on this earth. Even though I realize that this means you’ll be celebrating more birthdays and you’ll grow up into a man sooner than I really want, I’m also eager to see what God has planned for you. I couldn’t be any prouder or love you any deeper. *While this quote is often attributed to Eric Liddell, it was actually written by Colin Welland for the script to the movie Chariots of Fire. Joel is turning into a fine young man. Thanks for helping me raise him, Jon. You are as good as gold to us all. 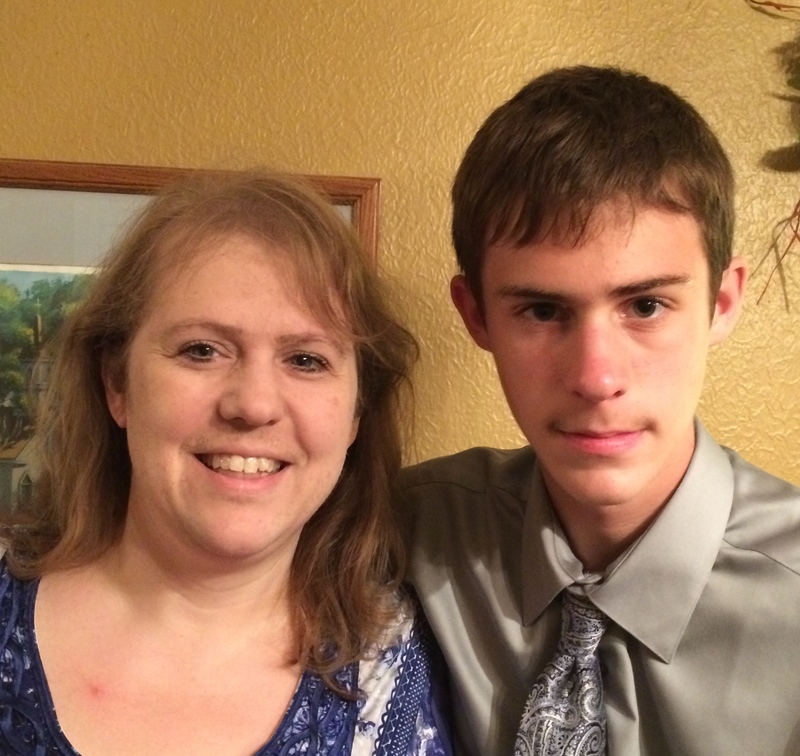 I’m so proud that I can call myself the aunt of this wonderful young man! Love you, Joel! I printed out a copy to put in his box of special things. I hope it will mean something to him later on in life. Beautiful! It’s so bittersweet when our kids grow. We raise them to grow and to see that they are growing into good people, it’s amazing. But it goes so quickly. It looks as though you have a great son! Happy birthday, Joel! I’m partial to my him, as I am to all five of my kids. It does go by so very quickly. Best parenting advice I ever got was the advice to remember that “the days are long, but the years are short.” I’m finding that the farther into raising my children I get, the truer this sentiment becomes. You do seem to have a great kid. Don’t let school, stress or expectations break him. Good luck to you both for your future. Have fun with the A to Z challenge. Good advice to remember … he’s definitely a high achiever and keeps me busy with everything he wants to accomplish. Thanks for reading and commenting!